Visualizations and promo videos from the PBS series "America Revealed" were passed around this week, and it's easy to see why they caught on. Maps like these are fascinating. Those pictures are impressive, but what drew me in was the mix of visuals and context that you see within episodes of the TV series. So often we're presented with visuals or a story. But if visualizations are meant to do more than paint pretty pictures, we need the "and" — data and a story, a visualization and its context. This is why Hans Rosling's approach is so compelling. With that in mind, this week's visualization is a segment from the "Electric Nation" episode of "America Revealed" that illustrates — and explains — the development, use and fragility of the United States' electric power grid. The segment is below and you can find the full 53-minute episode available for free here. Other episodes in the series are posted here. (Note: If the embedded video doesn't jump to the electric grid segment, scrub to the 4:34 mark. The segment runs until 8:39. Watch for the grid maps and the illustration of the 2003 Northeast blackout.). Sports and data go together like defense and championships and hot dogs and baseball and cliches and sports references. Yet, many of the visualizations of all that great data tend to be on the dry side — boxy strike zones and field goal ranges and the like. But then there's this: The New York Times teamed up with professor Kirk Goldsberry (@kirkgoldsberry) to visualize the shot selection and success rates of the NBA's Miami Heat and Oklahoma City Thunder. They also visualized shot data for each team's stars. Shot selection and completion visualizations for LeBron James and Kevin Durant. See the full interactive version. The real kicker — and this is something I wish more visualization creators would do — can be found in the brief analysis accompanying each visualization. It's one thing to see a visualization about LeBron James' shot patterns, but it's infinitely more interesting to see that visualization, read about what it's showing you, and then understand that visualization. Be sure to check out the full series and read the associated article. This week's visualization comes from John Nelson of IDV Solutions, who has taken data from the National Oceanic and Atmospheric Administration (NOAA) to map tornado paths and F-Scale frequencies. "It tracks 56 years of tornado paths along with a host of attribute information. Here, the tracks are categorized by their F-Scale (which isn't the latest and greatest means, but good enough for a hack like me), where brighter strokes represent more violent storms." This week's visualization comes from The New York Times, which tries to shed a little light on Facebook's initial public offering by showing how it compares to the 2,400 technology IPOs that have occurred since 1980. The visualization begins with a timeline of tech IPOs that runs up until last week. Until then, Google had the largest market capitalization with a value of $28 billion at its launch. The next image in the visualization series then adds Facebook to the mix — the animation makes the other IPOs literally shrink in comparison. Facebook's value at launch was $104 billion. 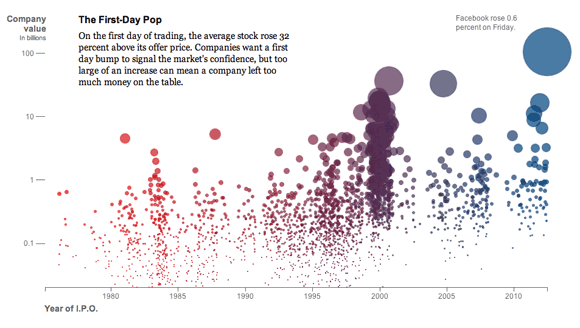 Screenshot from the New York Times' tech IPO visualization. The bubbles for each company reveal their value at the time of IPO, the percentage change after one day of trading, and their value three years later. This week's visualization comes from PhD candidates David Quinn and Daniel Wiesmann, who've built an interactive web-mapping tool that lets you explore the "urban metabolism" of major U.S. cities. The map includes data about cities' and neighborhoods' energy usage (kilowatt per hour per person) and material intensity (kilo per person) patterns. You can also view population density. Click to see the full interactive version. Quinn writes that "one of the objectives of this work is to share the results of our analysis. We would like to help provide better urban data to researchers." The map allows users to analyze information on the screen, draw out an area to analyze, compare multiple areas, and generate a report (downloadable as a PDF) with more details, including information about the specific data sources. Quinn is a graduate student at MIT; Wiesmann is a PhD candidate at the Instituto Superior Técnico in Lisbon, Portugal. Marvel's "The Avengers" opened in U.S. theaters last weekend, claiming the largest weekend opening so far this year and setting a new three-day domestic box office record. The film features a superhero team comprised of Iron Man, Thor, The Hulk, Captain America, Black Widow, and Hawkeye. But as fans of the comics know, this isn't the original or the only composition of "The Avengers." When the team first appeared in 1963, it was made up of Iron Man, Ant-Man, Wasp, Thor, and the Hulk. Captain America was discovered frozen in ice in Issue #4. The only real constant of "The Avengers" over the years is its rotating roster of superheroes. That changing makeup of "The Avengers" is the theme of this week's visualization, created by The New York Times' data artist in residence Jer Thorp. On his blog, Thorp has posted a series of visualizations about these superheroes that uses comicvine.com's API. "My first thought was to use images of the characters in my visualizations, but while the Comic Vine API provides images in all kinds of sizes, the styles of drawing are so varied that it ended up not holding together. Instead, then, I built a small tool that let me go through those characters and pick three colours that I thought represented them the best (everybody gets a shield!)." Below is a depiction of all "The Avengers" characters, ordered by the frequency in which they appear in the series. And sorting by issue (characters appearing in an issue together form a radial line), here is every appearance of every Avenger team member in every issue. Read the full post to see many more visualizations based on "The Avengers," including the gender ratio of the superhero team and the types of villains they often had to assemble to battle. Mike Kinde, writer for the site Ideas Illustrated, has created a project that visualizes the etymology of the English words used in various passages — a sports article, a medical article, a United Nations document, Charles Dickens' "Great Expectations," and Mark Twain's "The Adventures of Tom Sawyer." "Using Douglas Harper's online dictionary of etymology, I paired up words from various passages I found online with entries in the dictionary. For each word, I pulled out the first listed language of origin and then reconstructed the text with some additional HTML infrastructure. The HTML would allow me to associate each word (or word fragment) with a color, title, and hyperlink to a definition." Visit the site to hover over the words in the passage to see their origins and definitions. Kinde's blog post also contains interesting etymological findings from other types of literature. This week's visualization comes from Interactive Things, a design and technology studio based in Zurich, Switzerland. The company has been working on a project called "Ville Vivante" — the living city. "Based on the premise that the mobile phone has become the center of our everyday communication and main source of information, the City of Geneva, in cooperation with the Lift conference, decided to take the challenge to visualize the digital traces created by our mobile phones ... the goal of the project was to visualize the urban flow of everyday life and make it visible to passersby at the local train station." Screenshot from the "Ville Vivante" visualization. See additional screens and learn more about the project. In the Interactive Things' blog post, the company talks about some of the design decisions that went into making visualizations that were aimed at the public and installed in public places. The data comes from the Swiss telecommunications company Swisscom, and the dataset used for the visualization is based on one week's worth of mobile data usage. Last week's featured visualization mapped the geographic background and intended destination of the passengers on the ill-fated Titanic. 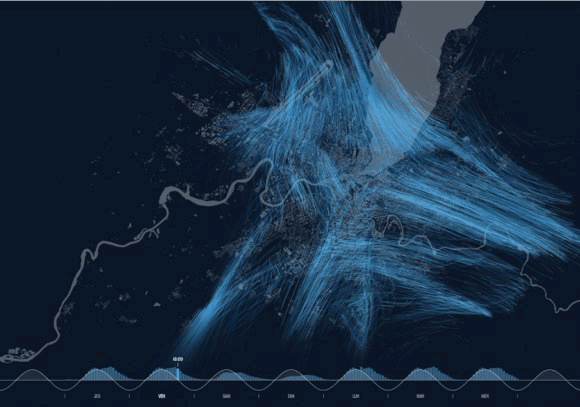 This week's visualization also examines oceanic travel, but of a different sort. The visualization comes from Ben Schmidt and shows more than 100 years of trade routes, from 1750 onward. "This shows mostly Spanish, Dutch, and English routes — they are surprisingly constant over the period (although some empires drop in and out of the record), but the individual voyages are fun. And there are some macro patterns — the move of British trade towards India, the effect of the American Revolution and the Napoleonic Wars, and so on." Schmidt has another visualization on his blog that breaks down the data based on seasonal patterns. A grad student at Princeton, Schmidt admits that "19th century ocean trade isn't exactly much my field," but he does offers some insights into why the maps look this way and what's missing (Darwin's Beagle, U.S. data, and so on). Anachronistic language in "Mad Men"
It's been 100 years since the tragedy of the Titanic — the sinking of the ship, that is, not the James Cameron movie. One of the worst disasters in maritime history, more than 1,500 people lost their lives when the ship struck an iceberg at 11:40 p.m. on April 14, 2012. It took less than three hours for the "unsinkable" ship to sink. GIS software maker ESRI has created an interactive map visualizing the fates of the ship's passengers. The map breaks the passengers down by class and by geographic background, highlighting their different origins and destinations as well as their different survival rates. The first-class passengers were primarily from "affluent" European and American cities, while the third-class passengers came from a variety of locations, including Scandinavia, Ireland, Slovenia and Lebanon. Many were emigrants, planning on making a new life in America. Just 183 (27%) of those third-class passengers survived, while 324 (60%) of the first-class passengers survived. Screenshot from ESRI's Titanic visualization. See the full version. You can view passengers' origins, where they boarded the Titanic, as well as their intended destination. See the full visualization here. The visualization below comes from the data viz company Meurs. 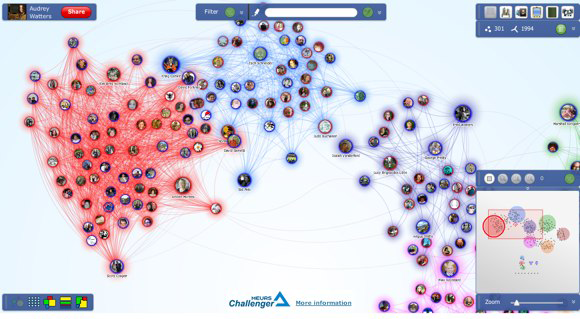 It's a Facebook app that uses a concept similar to InMaps to visualize your Facebook network. With the app, you can see how your friends are clustered based on education, location, occupation, and so on. 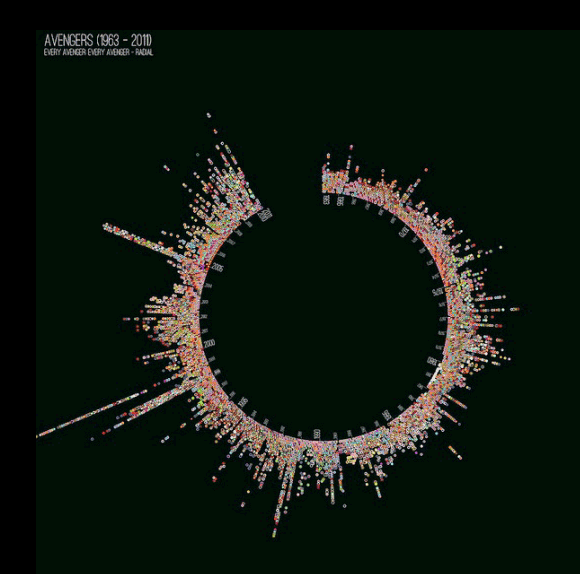 You can also view the clusters as arranged by movie, TV, books, and music "likes." It's particularly revealing to see which of your Facebook friends are in the Nickelback cluster, or in my case, that none of the people I went to grad school with (for literature, I should add) have "liked" any books on Facebook. "I get kind of giddy whenever I see a tweet from Martin Wattenberg and Fernanda Viegas. They rarely tweet, but when they do, it's usually because they've released a new project and they always announce it simultaneously." 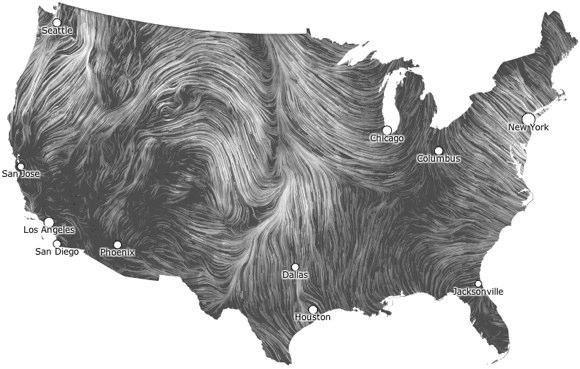 Tweets this week from the two renowned data visualization artists unveiled their latest project: Wind Map. It's a beautiful visualization — Van Gogh-like with its swirling patterns — created using "close to live" data of the country's surface wind speed. The trajectory of wind flowing across the U.S. Click to see animated/interactive version. In addition to watching the patterns of the winds flow, you can click to zoom in and see more information about wind speed and direction. The ChronoZoom Project is an impressive new timeline tool that aims to deliver an online visualization of Big History, an emerging field of study that examines the past based on findings from multiple disciplines (including biology, astronomy, geology, climatology, archeology, economics, anthropology and environmental studies). In other words, it's history since the beginning of time. A field that encompasses 13.7 billion years involves a huge amount of data, and that data is difficult to track, let alone visualize. ChronoZoom is meant to help aggregate this data — data about the cosmos, Earth's history, the history of life on this planet as well as human history — and make it all searchable and displayable. Screenshot from the ChronoZoom timeline tool. You can interact with the complete timeline here. "... to display the scales of history from a single day to the age of the Universe requires the ability to zoom smoothly by a factor of ~1013, and doing this with raster graphics was a remarkable achievement of the team at Live Labs. 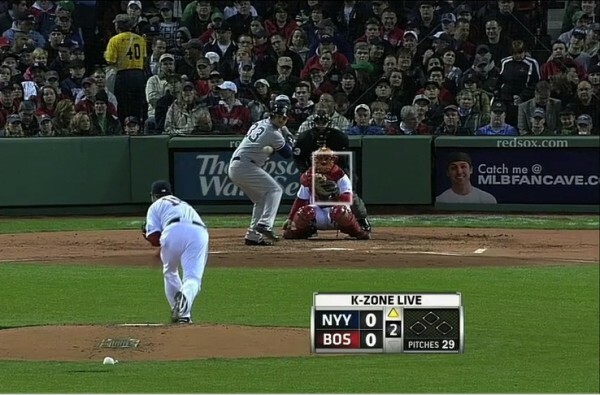 The immense zoom range also allows us to embed virtually limitless amounts of text and graphical information." ChronoZoom is open source, and the team is asking for feedback from both the developer and academic communities on the project. Visualization of the Week: Kids Count in Washington, D.C.
At the recent DC Data Without Borders Datadive, a group came together to build a project for DC Action for Children, an advocacy group looking to improve the lives of the youngest citizens in Washington, D.C. The team — comprised of Jason Hoekstra, Sisi Wei, and Jerzy Wieczorek — created a data visualization that shows detailed information about neighborhoods and schools in the DC area. The visualization includes information about average family income, number of police stations, number of libraries, number of child care facilities, and percentage of families living beneath the poverty level. 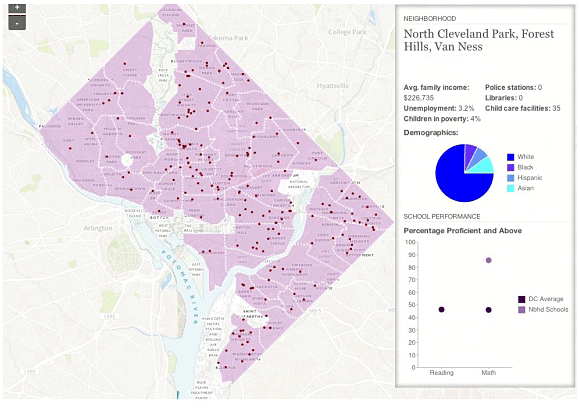 At the school level, the visualization also shows the percentage of students who receive free and reduced school lunches as well as how well students perform in math and reading compared to other DC schools. Screenshot from the D.C. Kids Count visualization. See the full interactive version. You can explore the visualization here. The Strata Conference wrapped up yesterday. Who was there and where did they come from? That's what The Guardian and Information Lab looked to discover in the following visualization. You can view the entire visualization here. Visualization of the Week: Anachronistic language in "Downton Abbey"
The British television show "Downton Abbey" has just wrapped up its second season here in the U.S., and the historical drama has been well received by both critics and fans. Despite the show's popularity and critical acclaim, it has come under fire for a number of anachronisms that have slipped into the characters' dialogue, most notably when the house maid Ethel quipped, "I'm just sayin'." Schmidt ran every two-word phrase from the episode through the Google Ngram database to see how the show's language matches up with circa-1917 English. 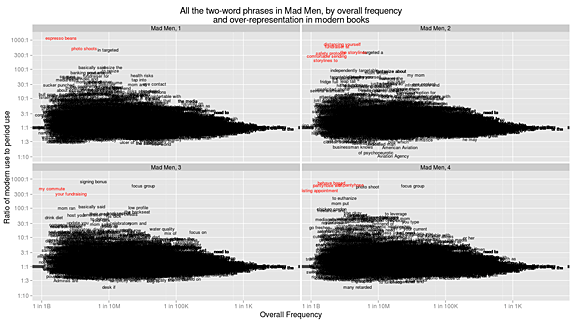 He explains the visualization in his post: "Left-to-right is overall frequency; top to bottom is over-representation. Higher up is representative of 1995 language; lower down, of 1917." 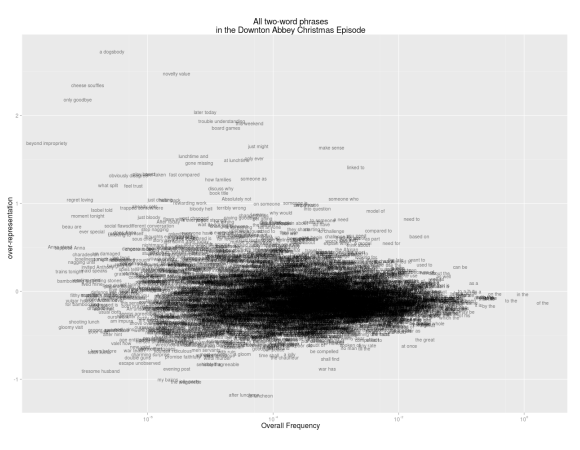 Visualization of two-word phrases used in the "Downton Abbey" season two finale. Read more about this visualization and see a larger version. "So: how does it look?" Schmidt asks. "In short: not too bad. This was one of the best episodes of the season, anachronism-wise." For those curious how "Downton Abbey" compares to other historical dramas from the same period, Schmidt also discusses anachronisms in other well-known films and TV shows. Interestingly, the patterns in "Downton Abbey" are quite similar to "Gosford Park" — no surprise, perhaps, since both share the same screenwriter, Julian Fellowes. This week, President Barack Obama submitted to Congress his budget for the 2013 fiscal year. You can wade through the entire budget here, or you can get a different look at the budget data through the New York Times' interactive visualization. The Times visualization offers four different ways to examine the budget proposal: all spending, types of spending, changes, and department totals. 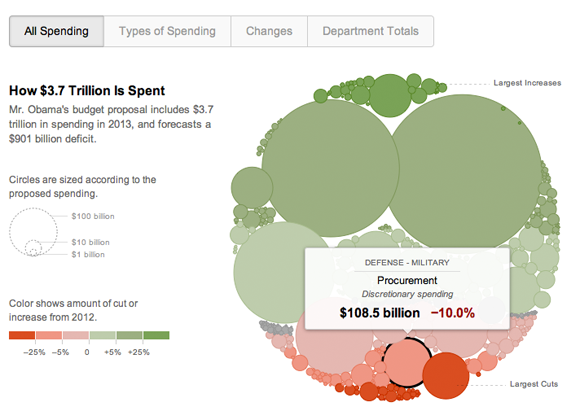 Screenshot from the New York Time's 2013 budget visualization. See the full interactive version. The visualization opens on the "all spending" tab where you can see circles whose color and size represent the size and changes in spending. The size of the circle depends on the amount of spending, and the colors show change — green for more money proposed, red for less. The transition between the tabs is animated. For example, when you click between the "all spending" and "types of spending" tabs, the circles reposition and regroup. The full visualization can be seen here. Hundreds of storm chasers and scientists are active during the spring and summer, the months when tornadoes are most likely to form over the Great Plains. 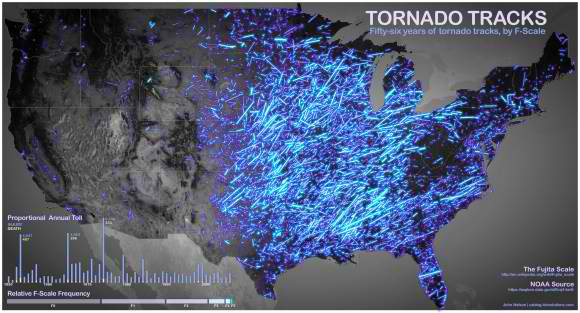 Tim Dye at Data Tech Art has created the following visualization that tracks the storm chasers. His ChaserTracer takes data from the Spotter Network and maps it alongside damage reports from the National Oceanic and Atmospheric Administration (NOAA).